You will be welcomed by our friendly and professional dental staff the moment that you enter our practice. We have amenities that were designed with you in mind, and we offer a fresh coffee and beverage center while you are waiting for your appointment. Once your appointment time ready, you will be led back to a comfortable treatment room. One of our friendly hygienists will explain all of the procedures that you will receive in order to prepare you. Dental X-Rays will be taken if necessary. During your dental cleaning and exam, you will be able to relax in our comfortable dental chair and watch one of our satellite televisions that are placed in each treatment room. Your teeth will be professionally cleaned with the gentlest care, while our hygienist walks you through each step. Once your cleaning is complete, Dr. Sagunarthy or Dr. Mokris will come in for a thorough oral exam to ensure that there are no concerns. If there are any concerns, they will be addressed with you right away. 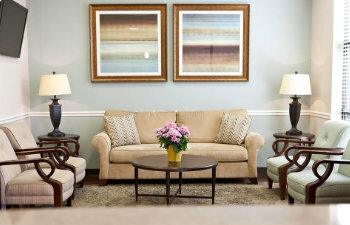 For patients who need a little extra help relaxing at the dentist’s office, we are proud to provide sedation dentistry. Gold Hill Dentistry is proud to be the trusted source in Fort Mill, SC, for complete family and cosmetic dental care. We are committed to providing conservative and preventative care to decrease the need for more invasive dental procedures. We invite you and your family to join our dental practice, and we look forward to building a long-lasting relationship with you as we care for your smile.